Many of us have 6Volts emergency light units in our house. The batteries there are of 6Volts 4 to 4.5AH. These batteries are SLAMF battery (Sealed Lead Acid Maintenance Free), and these can’t be repaired by replacing lead plates, etc and we have to replace battery every one or two years. But we can make a easy LED emergency light system by those rejected batteries by some simple circuit and repairing the battery a little. First we need to open the battery cover and there is three rubber caps, we remove them and add 1250 gravity acid water in those cells by a syringe. 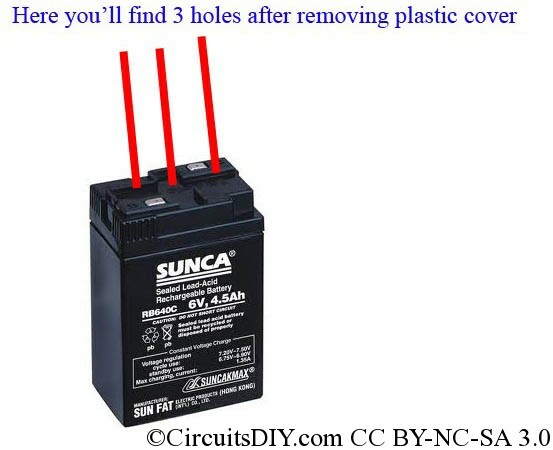 Then we close the battery and from then, we will charge the battery by 9Volts supply and will draw 2 white led (dome type) in a series connection to light them. You can use more LED in multiplier of two but backup will be also less. Of course, you can try this below circuit but this will draw more power so battery(repaired) will not last more. Yes, I have tried. The performance is not totally satisfactory.